June 7, 2018 | -by: Kevin George. Independence Day, the 4th of July is just around the corner. Not only is it one of the most anticipated holidays for all Americans, it is also a great time for marketers to show off their products, services, sales and offers in their compelling emails to shoot up sales and improve brand visibility. Be it any industry, brands have been increasingly harnessing the power of email marketing to fuel their sales. It can be done best by adding some seasonal flair to your email campaigns to grab your customers’ attention. This year, interactivity, hyper-personalization, and typography are some of the trends email marketers must tap into to create eminently designed emails. The popular sunglasses and eyeglasses brand, Ray-Ban has used a classic theme of Independence Day. With eye-catchy product images and a bold headline, the email draws attention and persuades the subscribers to click on the clear and bold CTA. The email has navigation links to their online store and social sharing buttons which makes it easy for the subscribers to browse through and share. 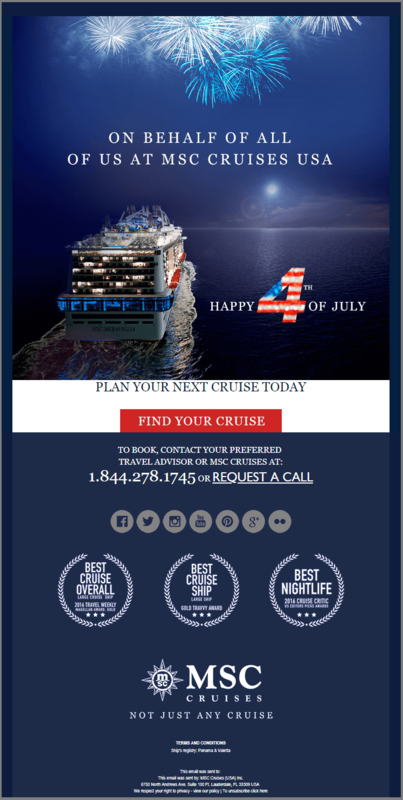 This is a simple Independence Day greeting email from MSC Cruises that features a classic theme and an attractive hero image. With bare minimum text and prominent CTA, the email takes the subscribers on a visual treat. Unionmade, the garment company uses its products in the hero image to form the colors of the national flag, which is the highlight. Apart from wishing the subscribers, this Independence Day email also notifies them about their new store address. There is no specific CTA in the email; whoever clicks anywhere on the email is taken to the online store. This email from Elie Tahari has a simple yet attractive layout. With the optimum use of white space, the offer and code are highlighted in bold colors of the national flag. The GIF animation further adds life to the simple email. 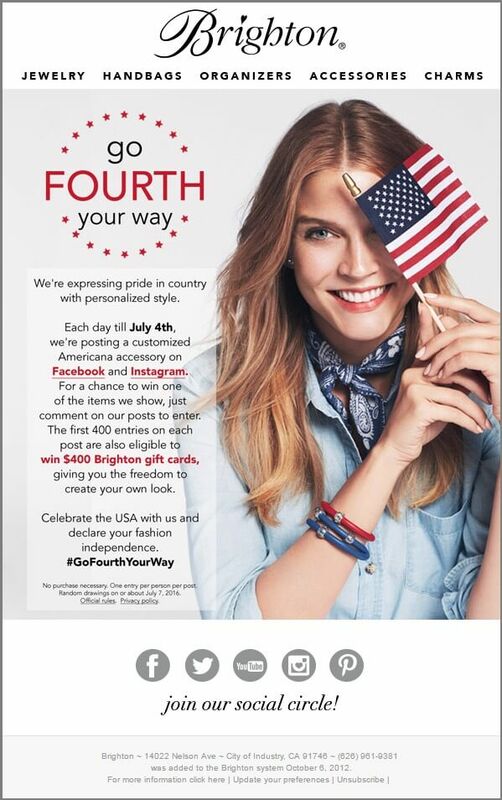 This email by Brighton introduces a contest run by them, supporting their Independence Day promotions. The hero image co-ordinates well with the text as well as the Independence Day theme. The emphasis on joining the social circle and the use of hashtag #GoFourthYourWay improves chances of user engagement. 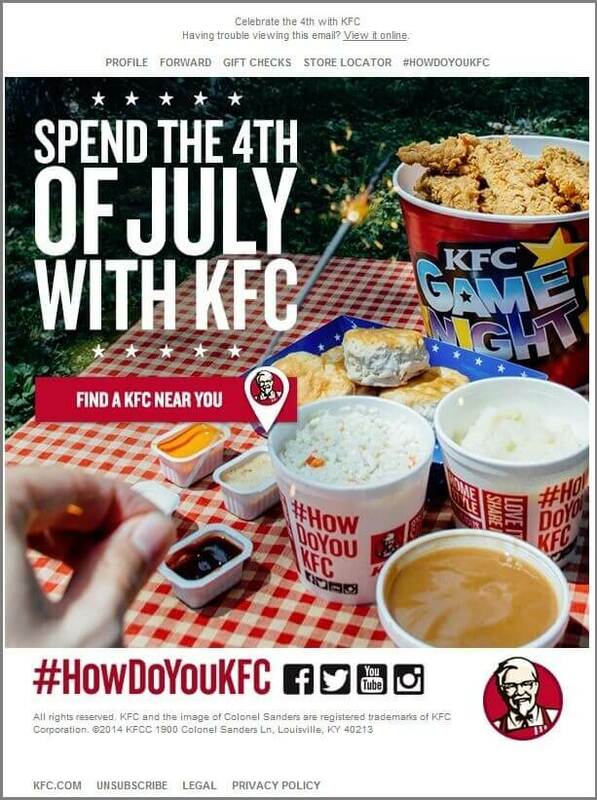 Fastfood giant KFC tapped into the Brand association aspect with a bold text and hero image showing the brand products with an outdoor picnic complete with sparklers. The headline and respective CTA, along with the hashtag #HowDoYouKFC, is likely to entice subscribers to click through the email. A simplistic email by the headphones brand Skullcandy has an overall clean look with a stamp stating the origins of Company, Independence Day wishes and option to get a product delivered in the color scheme of the American Flag neatly arranged. If you are struggling with getting your Independence Day emails ready, worry no more! Monks can help you design and code wonderful emails as per your branding and business needs. Send us your requirements at hello@emailmonks.net. We also have some interesting and FREE EMAIL TEMPLATES for your other Email Campaigns. DOWNLOAD NOW! Thank you for pulling together these examples. I needed some inspiration.